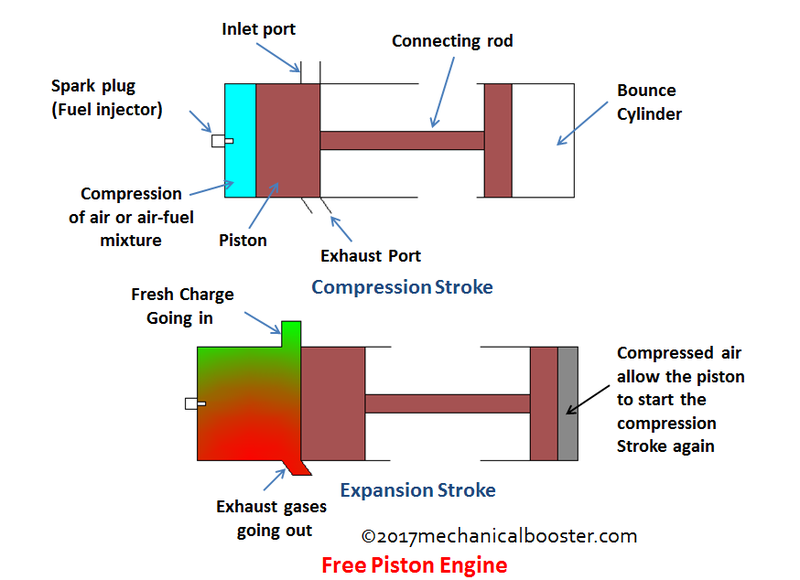 How Free Piston Engine Works? 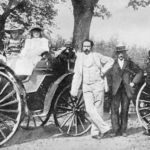 The introduction of the internal combustion engine in 1884 by Edward Butler was the boom in the world of machines as engine is the machine that gives rise to the invention of many machines like a automobile vehicle, aeroplanes, marine vehicles etc. that we are still using today. The most beautiful thing about the engine that makes it a perfect machine is the conversion of chemical energy into mechanical energy. When we hear the word engine the first thing that comes in our mind is the automobile vehicle because IC engine is being widely used in automobile from over a century now. But let’s just think like an engineer since an engine is the perfect source that provides mechanical work then why its application is just restricted to the rotational motion only? This question increases the curiosity and gives rise to the Free Piston Engine. Let’s just study it in detail. 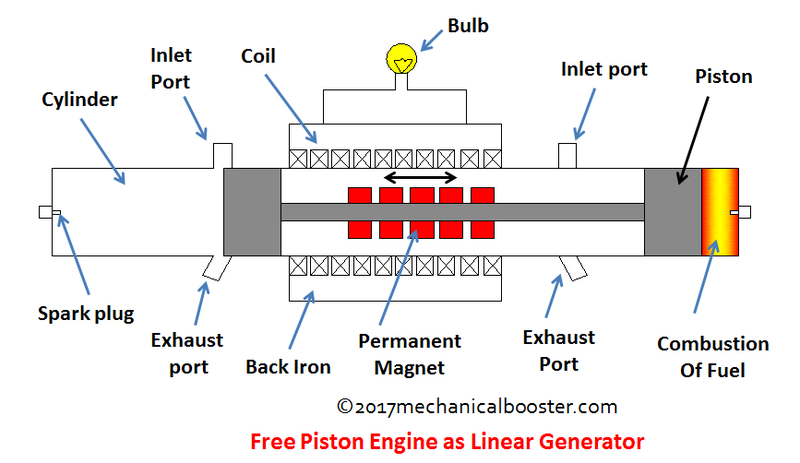 A free piston engine is the internal combustion engine in which the crankshaft from a normal I C engine used in vehicles is removed and the mechanical work is obtained just by the reciprocating movement of the piston or by some other mean. Generation of power is the main purpose of these kind of pistons that can be obtained by any means either by the exhaust gas pressure that can be used to drive turbine or through the linear motion of the piston that can be used as an air compressor for pneumatic power or by coupling the linear alternator with the moving piston to generate electricity. Due to development of machines like turbines, compressors etc. It was required to find the source of energy that can run these machines, the sources which were available (most common of all is the burning of the fuel like wood, coal etc.) required large setup and also were inefficient due to the lack of symmetry. This problem was solved with the invention of the free piston engine in which there is a symmetrical and efficient way of the conversion of chemical energy into mechanical work. The burning of the fuels like wood, coal etc. were causing lots of pollution due to the impurities present in them, this problem of the pollution was later solved with the introduction of the F P engine that uses pure fractionally distilled fuel which in turn decreases the pollution causing emissions. F P engine provides application flexibility which means it provides lots of different ways to use the mechanical work produced by the combustion of fuel. This in turn makes it easy source of energy. 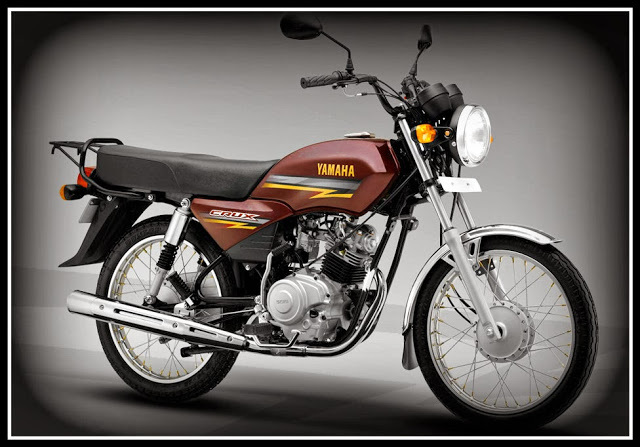 Due to these reasons the new concept of engine than can be used for different purposes was developed and named as free piston engine. 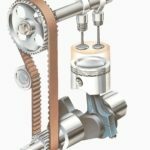 What is Compression Ratio – Petrol and Diesel Engine? 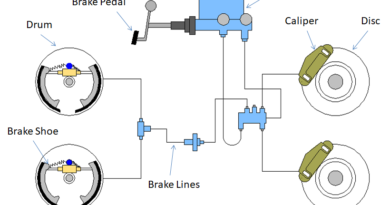 What is Gear Ratio in Transmission System? Free piston engine works on the same principle on which I C engine of an automobile works i.e. the combustion of the air-fuel inside a closed cylinder produces reciprocating motion in the piston which is the obtained mechanical work. So the components of both the engines are also almost same. It is basically a two stroke engine. 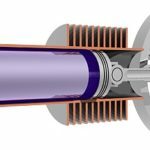 Combustion chamber or cylinder- Same as the I C engine a combustion cylinder is the rigid cylindrical chamber inside which the combustion of air-fuel takes place, and also it is the housing inside which piston moves. Piston- It is the rigid cylindrical part of the F P engine that produces reciprocating motion inside the combustion chamber due to the combustion of the air-fuel mixture just like the I C engine. Engine head- It is the head of the engine the spark plug or fuel injector is attached, engine head is mounted over the combustion chamber just like the I C engine. Spark plug or fuel injector- The spark plug is used to ignite the air-fuel mixture and fuel injector injectects the diesel fuel during the compression of air which results into the combustion. Bounce cylinder: It is cylinder with a piston which is interconnected with the main piston. The main function of the bounce cylinder is to stored the energy during expansion of the F P engine and apply it to starts the compression stroke again for the working. Linear alternator is coupled with the piston of the F P engine for the generation of the electricity. 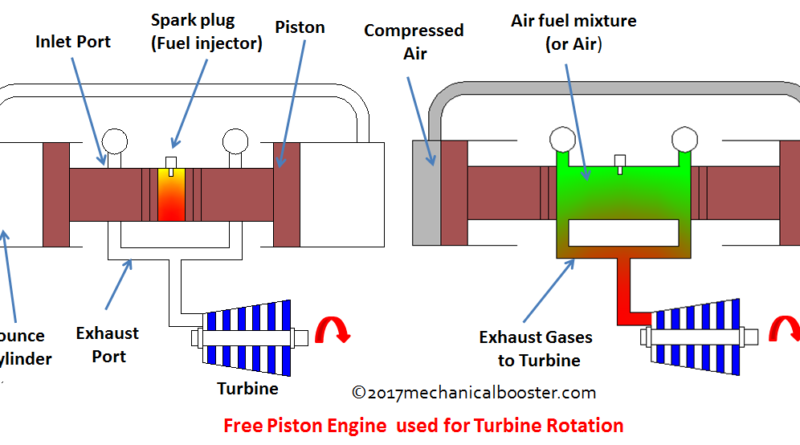 Note – For some applications of F P engine like the air compressor, turbine rotation etc. No loading device is used to obtain mechanical work. 7. Fuel – Of course just like an I C engine the most important part of an F P engine is the fuel that can be petrol or diesel depending upon the type of F P engine used i.e. Spark ignition F P engine or Compression ignition F P engine. The fuel (air-fuel) is the chemical energy that is burned inside the combustion chamber to produce mechanical work i.e. reciprocating motion of the piston. The electricity generator is the device that is used to generate electricity with the help of the F P engine as an external source of energy, for the generation of electricity a linear alternator is coupled as a loading device with the F P engine. The fuel enters in the combustion chamber of the engine in the expansion stroke and gets ignited at the end of the compression stroke either by the spark plug (gasoline engine) or by compression (diesel engine). This combustion of the fuel inside the combustion chamber produces high stress pulses over the surface of the piston which in turn produces the reciprocating motion of the piston. This reciprocating motion of the piston is then transferred to the linear alternator which is used as the loading device and is coupled with the piston. Due to the reciprocating movement of the permanent magnet attached to the connecting rod of the piston, there is a fluctuation of the magnetic field takes which induces current and voltage in the coil and electricity is produced that is further stored in the accumulator (battery) used in electricity generator for the further use. It is the device which is used to compress or increases the pressure of the air for the various purposes like pneumatic machines with the help of free piston engine as the external source of energy. 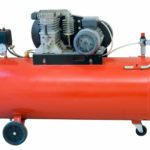 For using F P engine as a air compressor no loading device is used but there is the coupling of air compressor cylinder with the plates which are mounted at the tail end of the piston. Same as the electricity generator fuel enters at the end of the expansion stroke and gets ignited at compression stroke of the F P engine respectively but there is the entry of the fresh air inside the air compressor cylinder during the expansion stroke through the inlet valve of the compressor cylinder. Due to that combustion, reciprocating motion of the piston is produced which in turn compresses the air inside the compressor with the help of the seizing plate mounted at the tail end of the piston. This compressed air is then taken out through the exhaust valve of the compressor for the further work. 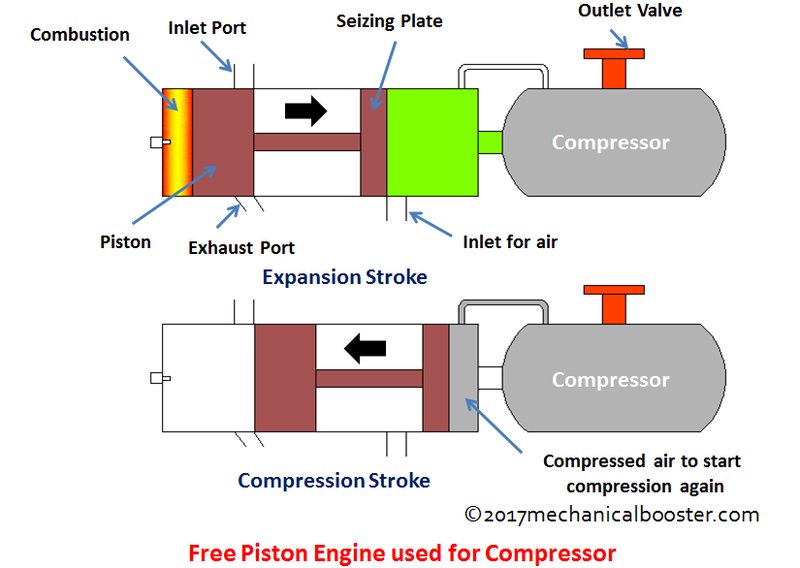 Note- At end of the expansion stroke, the air from the compressor is enter into the cylinder at tail end and forces the piston to begin the compression stroke again. The free piston engine is also used to rotate the turbine of the turbine electricity generator for the production of the electricity. 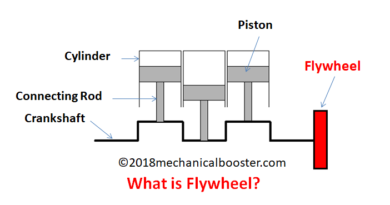 In this application of the F P engine instead of the reciprocating motion of the piston, exhaust pressure of the engine is used to apply force over the blades of the turbine which in turn causes rotation of the turbine. The entry of fuel through the inlet port of the engine takes place at the end of expansion stroke of the engine. After the entry of the fuel inlet port closes and the compression of the fuel due to the compression stroke occurs which in turn increases the pressure of the fuel inside the combustion chamber. After this compression fuel gets ignited either by spark plug (gasoline engine) or by compression (diesel engine) depending upon the type of the F P engine used. Due to this combustion of the fuel high pressure impulse is generated which in turn pushes the piston and the expansion of the gases produced during the combustion occurs. The gases expanded during the expansion stroke are then exhausted with the high pressure through the exhaust port of the engine during the expansion stroke. 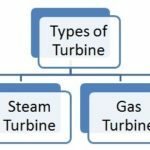 These exhaust gases having high pressure are blown over the blades of the electric generator turbine which in turn causes rotation of the turbine and the generation of the electricity takes place. Apart from these above mentioned applications free piston engine with different loading and rebounding devices are widely used in various machines like hydraulic machines, marine devices, aerospace devices etc. But the basic working principle of all these devices is same i.e. reciprocating motion of the piston caused by the burning of the fuel is the mechanical output obtained due to combustion of the chemical substance(fuel). 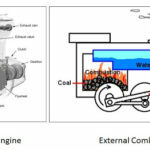 ← How Coal Power Plant Works? – Do You Know?